You'll want to add these old fashioned dessert squares recipes to your recipe box. Keep them handy for whenever you need to make an extra-special, mouth-watering treat for family, guests, or for taking to a party. They're the best. And, my thanks to Robert for taking time to share his family's treasured hermit squares recipe with us. I'm sure many will want to try it. And your Aunt Rose's homemade Ga Ga Hermits are also mouth-watering and delicious. Squares are always a popular sweet to serve on any occasion, and these vintage dessert squares recipes are some of the best I've seen. I just know you'll love them. Place softened butter, sugar, cocoa, vanilla, and egg into bowl. Set bowl in pan of boiling water, stirring until the mixture has completely melted and is the consistency of custard. Mix graham wafer crumbs, coconut, and walnuts. Add wafer mixture to cocoa mixture. Pack into ungreased 9x9x2-inch pan. Cover with filling. 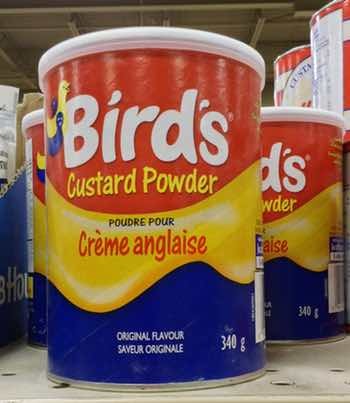 Note: Bird's® Custard Powder is the distinctive, traditional filling called for in Nanaimo Bars. It's an egg-free imitation custard powder that's quite popular in the UK and Commonwealth countries. If the brand product is unavailable in your area, substitute a vanilla custard-style pudding mix. Cream 4 tablespoons butter. Combine milk and vanilla custard pudding powder. Add to butter. Mix in two cups icing sugar. Spread evenly over chocolate wafer base. Allow to harden. Cover with icing. Mix 2 squares melted semisweet chocolate with 1 tablespoon softened butter. Spread evenly over filling and allow to harden in fridge, or a cool area. Did you know the famous Butterfinger® candy bar was invented way back in 1923 by the Curtiss Candy Company of Chicago, Illinois? Believe it or not, the company dropped the new candy bar from airplanes in selected cities across the U.S. to boost its popularity, and it became a huge overnight sensation. The Nestle® company purchased rights to the Butterfinger® bar in 1990. These chocolate squares are chocolatey, crispy and delicious. The big reason they taste so good is they contain actual Butterfinger® bars and miniature marshmallows, favorite treats for generations of candy lovers. Buy 6 Butterfinger® bars, standard size. Chop up 3 bars into a bowl, then mix in about 6 cups of toasted rice cereal and set aside. Now, melt 3 tablespoons of butter into a saucepan and add 4 cups of miniature marshmallows. Carefully heat on stove top until somewhat melted. Add the chopped bars and cereal mixture, then gently stir it all up. Pour the results into a 13 in x 9 in baking pan and let it cool until hardened. Crumble the rest of the Butterfinger bars across the top and then cut the pan contents into squares. Serve like fudge squares. Delicious! 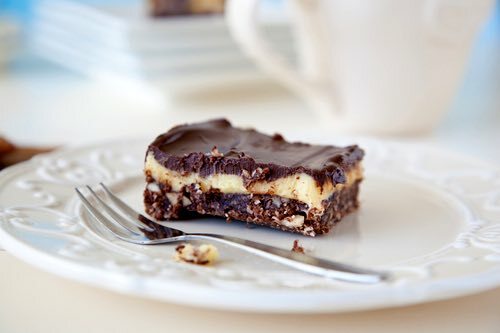 You've got to try this chocolate dessert squares recipe; it's so good tasting. It could be made using almost any favorite chocolate bar if Butterfingers® bars are unavailable. This old fashioned dessert squares recipe is taken from an old newspaper clipping. Baked treats like this were quite popular in the first half of the 20th century. Cream 1/2 cup shortening. Blend in 1 cup white sugar, 2 eggs beaten well, and 1/2 teaspoon vanilla. Add 1-1/2 cups flour which has been sifted with 1 teaspoon baking powder and 1/2 teaspoon salt. Pour into a shallow greased cake tin. Sprinkle with chopped nuts. Beat the white of 1 egg until stiff and then fold in 1 cup of brown sugar and 1/2 teaspoon of vanilla. Spread carefully over the nuts and bake in a slow oven (275°F) for 15 to 20 minutes. Makes about 15 delicious squares. 30 marshmallows, 1/3 cup butter, 1/2 tsp vanilla, 1 pkg Rice Krispies (5-1/2 oz). Melt butter and marshmallows in double boiler. Add vanilla, beat thoroughly to blend. Put Rice Krispies® in large buttered bowl and pour on marshmallow mixture, stirring briskly. Press mixture into shallow buttered pan. Cut in squares when cool. Yields 16 2-1/2-inch squares from a 10x10-inch pan. Nutmeats and coconut may be added, if desired. Rinse raisins and drain liquid. Melt shortening, stir in brown sugar and molasses. Add unbeaten egg and beat thoroughly. Sift together flour, salt, and baking soda. Add with oats and raisins to first mixture. Turn all into greased 8-inch square pan and bake at 350°F for about 25 minutes until done. Mix as shortbread, press in pan, and prick with fork. Bake 15 to 20 minutes at 350°F. 2 tablespoons gelatin powder in 1/2 cup water; soak as directed on gelatin package. Bring to a boil 2 cups white sugar and 1/2 cup water, let boil 2 minutes. Add hot sugar mixture to gelatin and beat by hand or mixer until like marshmallow. Spread over baked layer. May add chopped cherries, or almond flakes with a bit of almond extract to all or part of mixture. Color all or part of mixture pink, white, or green to suit the occasion. Hi! Here's a good dessert squares recipe. My grandmother got it from a neighbor back in her day. We make these marshmallow treats every year for Christmas and other holidays. The "Marshmallow Slices Recipe" is written on Grandma's recipe card with brackets and directions on each side of the sets of ingredients, so I'll try to make it clear. Add coloring of choice, 1 teaspoon vanilla extract (or almond, as desired), dash of salt. Add 3/4 cup powdered confectioners sugar slowly to gelatin mixture. Beat until stiff, then pour over baked layer. Optionally, sprinkle coconut on top. Beat one egg with one cup brown sugar. Pinch of salt; then add one cup of chopped walnuts, one tablespoon grated chocolate, six tablespoons sifted flour with a little, very little, baking soda. Bake for twenty minutes. When cold, cut in squares. 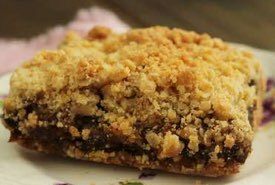 Hermits are a type of spiced cookie bar. These old hermit recipes have been passed down in my family for generations. 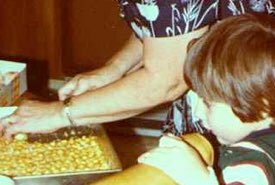 The first dessert squares recipe is from my Grandmother's cookbook, and the second is from my Aunt Rose's cookbook, Aunt Rose was my Grandmother's sister. I suspect that my Grandmother's recipe is a version of my Aunt Rose's modified by my Great Grandfather. My Great Grandfather was in the food service industry for much of his life. He worked as the head chef/kitchen manager in a country club for many years and at one time owned and ran an old time ice cream parlor. I believe he modified the hermit recipe during the Great Depression or possibly during Wartime when fresh milk was not readily available; hence, the nonfat dry milk powder. Enjoy! Stir together dry ingredients in a large bowl. Cream margarine and sugar, add corn syrup, water, and egg. Gradually beat in flour mixture and stir in raisins. Spread in a greased and floured 13x9-inch pan. Bake at 375°F until done — about 25 to 35 minutes. Let cool and cut in squares. Store in a tight box or tin. Mix Crisco, Karo, brown sugar and spices. Mix baking soda with hot water; add. Beat in whole eggs. Add flour and raisins. Bake in a shallow sheet pan (jellyroll pan) that has been greased and floured. Bake at 350°F until done — about 20-25 minutes. Cool and cut in squares. Keep in closed tin for freshness.